This article on wheelchair accessible homes is a continuation of an article on the Universal Design Living Laboratory, a real home dedicated to proving out technologies and practices that make a home accessible to people with physical limitations. So what has to change to make our homes wheelchair accessible? Let’s start with handles. In a house that primarily means door handles, but other handles also come into play. In the case of Rosemarie Rossetti being accessible primarily is a matter of being able to reach the handles. If she can reach it she can probably turn it. In some cases the heights of handles have to be altered from their traditional positions. One case in point is her windows. All the windows are casement style with the control handle at the base, which she can easily reach. That is not uncommon for a casement window, but what is special is the locking tabs that seal the windows closed. For most large casement windows there would be two locks. One at the top and one at the bottom. Her windows are designed with one locking tab, down low, within easy reach. Some people will not have a problem with reach, but they do have a problem grasping the handles. I once had a short bout of very severe arthritis. I could not turn a round door handle. I had to use two hands to open a door. In Rosemarie’s home the door handles are all of the lever style. These are easier to grasp, and can be turned without actually grasping the lever if need be. Simply push on the end of the lever. In a few rooms she uses pocket doors. Pocket doors are pretty cool, but nothing new. They date back to the 1830’s. I remarked to her that the hardware on her pocket door looked nearly identical to the hardware on a house from my boyhood, a house from the beginning of the 20th century. However there was one exception. 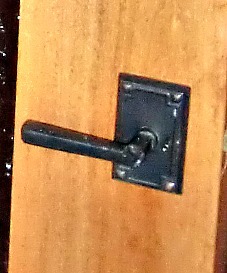 The handle, which recesses into the door, had an unusually large hole to fit several fingers. That pocket door had an exceptionally light touch. It was easy to open and to close. This was true for all the doors, and drawers and cabinets. Everything had smoothly operating hardware. Where you and I can just use a little bit of muscle to force a sticky drawer someone operating from a wheelchair or supporting themselves with a cane might not be able to provide the necessary leverage. Accessibility can mean many things, but it might just mean a little extra maintenance. 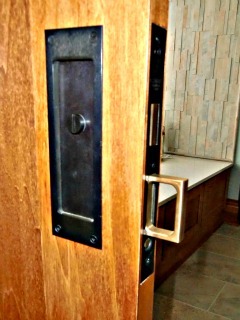 The focus on handles as an area of concern is evident in the kitchen. Here the hardware is all wide enough for a full hand to grasp. Compare this to most the kitchen hardware available on the market. They are often designed to be pulled open with only a few fingers and that is all the room that they give you. In the Rossetti home the handles are big enough that you can even used two hands if needed. Sometimes it is the little things, like properly sized handles and pulls, that turn houses into wheelchair accessible homes. There is a task that most of us do regularly without even thinking about it. It is a little bit of background work that we have to do in order to enjoy our modern conveniences. We plug things in and unplug them so often it has become a background task. Some things might stay plugged in for years, but others will go through the plugging ritual on a daily basis. In the Universal Design Living Laboratory every outlet is within reach from a wheelchair. In most houses outlets are about 14 inches off of the floor. In the Rossetti-Leder house they are 18 inches off of the floor. 18 inches puts them within reach without making a significant visual change, nor requiring modifications to building codes. This not only benefits people in wheelchairs it also benefits people who have difficulty bending or getting down on their knees. That covers a lot more people. Any builder should be able to see the advantages to the raised outlets. With an aging population more and more of their market will be having these types of issues. By making a change that requires almost no additional cost they can make their homes more practical and more marketable, and they provide an advantage over the existing stock of houses. Wheelchair accessibility is a major concern for the Rossetti home, but not everybody has this same issue. So why call it Universal Design when much of what it is concerned with involves only a portion of the physically impaired? There will always be unique circumstances that people with different limitations will face. Universal Design will not address everything, but it strives to design homes and products that can accommodate a much wider range of abilities than is currently typical of the marketplace. It turns out that if you design with a wheelchair in mind you end up with a house that can benefit a lot of people who aren’t in a wheelchair. Consider how Rosemarie and Mark addressed wheelchair accessibility in their home. The floors in their house consist of planks of a composite wood consisting of a veneer of real, handworked hickory over an engineered, milled base. The base is made from a softer wood, so less of the slower growing hardwood is required. By using multiple layers with the grain going in different directions warping and cupping is eliminated. It is stronger, more durable, cheaper, and more eco-friendly. The flooring was supplied by Mannington floors. The planks snap together along a glued edge. Rather than being nailed down they float on top of a mat made from recycled rubber. The mat provides sound insulation, limiting the transmission of noise as you walk or roll on the floor. While the wood floors are beautiful and quiet the accessibility feature comes from what isn’t there. You will not find any carpeting in the Rossetti-Leder home. Carpet creates extra rolling resistance. It might not be a problem for all physical limitations, but it is a definite disadvantage for someone pushing their way around. 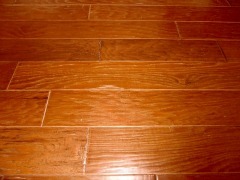 Floors often have transition points. When changing from one material to another, for instance from wood to tile there will be a little elevation change. At doorways there might be a low threshold. Where sliding doors are used their might be a track embedded into the floor. 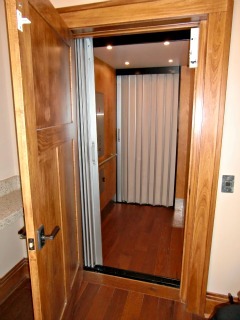 Between the door transom and the floor is an aluminum track for a retracting screen door. It has been set flush with the floor so wheels can roll smoothly through the doorway. All these transitions are places where people in wheelchairs often find they have some difficulties. In the Universal Design Living Laboratory the floors and transitions were designed to minimize the obstructions. All interior doorways were built without a transom on the floor. The goal is to be able to roll from one room to another without having to make special efforts. While the main benefit for this design is the person using a wheelchair, people using walkers will also benefit. The walkers will have less to catch on. In fact, anyone who has to take slow, halting steps will benefit from the lack of floor-level obstacles. Catching a toe or a heel is no big deal to me, but to someone with severe arthritis it might result in dangerous fall. Wheelchair accessible homes often benefit all types of people with physical limitations. 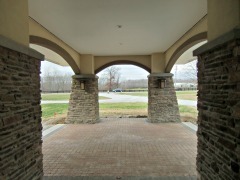 Since their home has a very public function and will receive many visitors they have a covered, drive-through entryway. Cars can be unloaded at brick drive that is level with the first floor of the house. There are no ramps to negotiate, no stairs and no steep slopes. It is one smooth roll from the car to the interior of the house. We elevate many of our houses, and there are good reasons to do so, but we often bring people up to the floor level with a series of steps. Designing for wheelchair accessible homes rethinks this and ensures that a person entering from the outside can do so easily. If bumps in the floor are a nuisance doorways can be a game-ender. A wheelchair is wider than a person. Old houses especially can be a problem, with narrow, odd-sized doors, but even modern houses have many interior doors that are just a little too narrow for comfort. In Rosemarie Rossetti’s house (the Universal Design Living Laboratory) the doors are all 36 inches wide. This is a standard sized door, so this is a relatively easy change for builders to make. The real change has to come with the architects. They need to plan their rooms and hallways with these wider doors in mind. It is a little surprising to find wheelchair accessible homes that are multiple-story. One of the easiest decisions to make when designing such a place is to keep everything on one level. However, this isn’t always practical or economical. In big cities houses naturally grow tall because land is so pricey. In the case of the Universal Design Living Laboratory it was convenient to have rooms for training that were off separate from the living area and the best place was to put this extra space was below grade. That meant that they needed to have a means of getting wheelchairs to the lower floor and back up again. There are two basic options. One is an inclined platform lift system, which is rather like an escalator for wheelchairs. The other is an elevator. In the UDLL they use an elevator by Garaventa Lift. It runs from the second floor, with its one little room, all the way down to the basement. An elevator is a pricey option, but might be cheaper than buying more land and spreading out. The Garaventa elevator is designed with wheelchairs in mind, so access within the elevator is not a problem. Floor bumps and door widths are not the only concern for wheelchair accessibility. In a wheelchair your legs stick out in front of you. This can be a problem when working at a kitchen counter or a bathroom sink. Check out DecorPlanet.com for some wheelchair friendly bathroom vanity ideas. If I am sitting at a desk, or table or a vanity the designers have already figured out that my legs need to slide under the working surface. That same thinking needs to be applied to critical areas around the home. Consider the stove arrangement that Rosemarie uses in her home. Rather than have the stove atop the oven the stove has an opening underneath. Rosemarie can roll right up to the stove and cook dinner facing the stove. Not only is there a place for her knees, but below that there is a kick-panel indented for her feet. The cook top itself is only one burner deep, and the controls are all up front, so she won’t be crossing open flames with her arms. 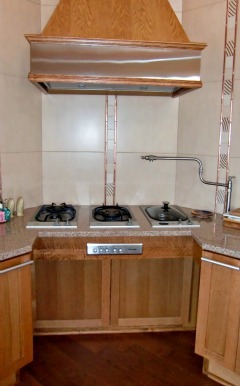 The whole arrangement is very shallow when compared to a stove on top of an oven. Similarly consider the kitchen sink. The storage underneath the sink is recessed, and the pipes have been routed as far back as possible. This allows her full access to clean the dishes without having to twist her body sideways. This type of access isn’t continued on for the full length of the counter. She would lose all of her below counter storage. Instead the kitchen is planned so that there are certain areas where she has that full access so that she can do her food preparation. If a person is standing working at a counter chances are his toes are actually underneath the counter. To make it comfortable to stand at a counter the bottom of the cabinet is indented. This is called a toe kick panel or just a kick panel. Usually this is about 4” high. For someone sitting in a wheelchair their feet are positioned on footrests. These footrests typically put the persons toes higher than the 4 inches. In Rosemarie Rossetti’s home the cabinet kick panels are all 9 inches tall and 6 inches deep. It is a minor thing, but it makes a big difference. Builders and cabinet makers should consider incorporating a taller kick panel into their design standards. While a little cabinet space is lost to the taller panel it also puts the bottom of the cabinet a little higher off the ground. This is a benefit even to fully-abled people, who won’t have to bend down as far. Another kitchen adjustment is the height of the counters. There are five countertop heights in the kitchen to accommodate a variety of people. The standard height of kitchen countertops is 36 inches from the floor. The countertops around the perimeter of the UDLL kitchen are 34" high. The height is a bit of a compromise between her needs and Mark’s needs. Mark stands at 6 foot 4 inches. To give him some area that is less of a compromise the center island has three different counter heights. This brings up an interesting paradox of Universal Design. The whole idea is to design inclusively for a broader segment of the population. Design to include those with physical limitation. Yet when you do this there are some cases where you are asking someone else to compromise. A house designed someone with physical limitations needs to also consider the those who are not so limited. Chances are there will be both in a household. In the case of kitchen counters perhaps the best answer is to have some areas where counter heights are adjustable. This concept is used in manufacturing to improve ergodynamics. The same concept needs to be applied to the wheelchair accessible homes, but at this point it is an idea that hasn’t taken root. There is another little feature in Rosemarie’s home that is not specifically designed to make life easier, but it is designed to accommodate the wheelchair. With a wheelchair a person’s feet are usually resting on footrests that ride a few inches above the floor. This often puts the feet in contact with the wall. Mark made sure that the base molding was extra high so that Rosemarie’s shoes will bump into the molding rather than the painted wallboard. I had mentioned previously that the moldings in the house were Craftsman-inspired. It is true that there were strong aesthetic reasons for making wide molding. In this case the wide molding also had a functional purpose in helping to accommodate the house to the wheelchair.